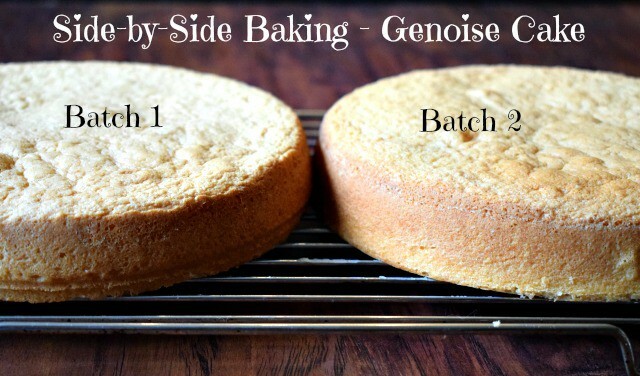 A comparison bake exploring 2 different methods of making genoise cakes. The aim is to identify if one is more effective than the other. Continuing with my Side-by-Side Baking series, this month I chose to look at two ways of making a genoise cake, specifically using the gentle heat of a bain marie whilst beating the eggs and sugar together to ribbon stage compared to a batter made without any heat. with a view to appreciating why we carry out them out. So for instance, last month we looked at curdled cake batters, but I’ve also looked at resting Yorkshire Pudding batters before baking, folding in flour by hand against that folded in with a spatula, butter quality in cake batters and the all-in-one method against the traditional creaming-in-method. 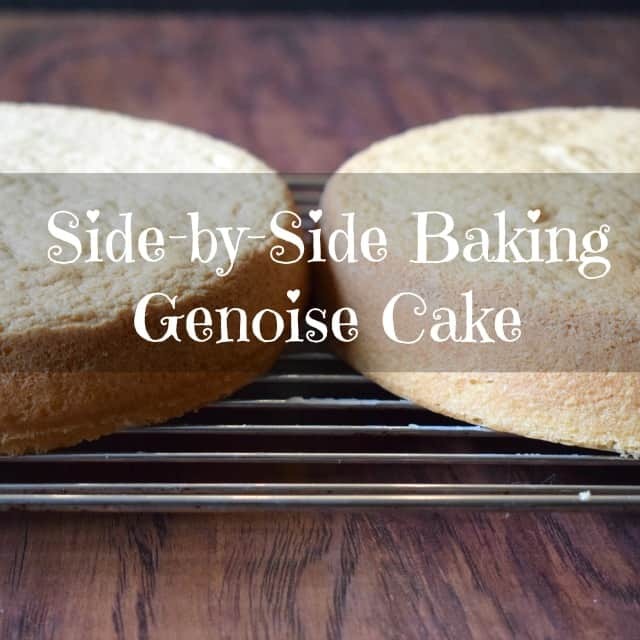 Side-by-Side Baking – Making a Genoise Cake. 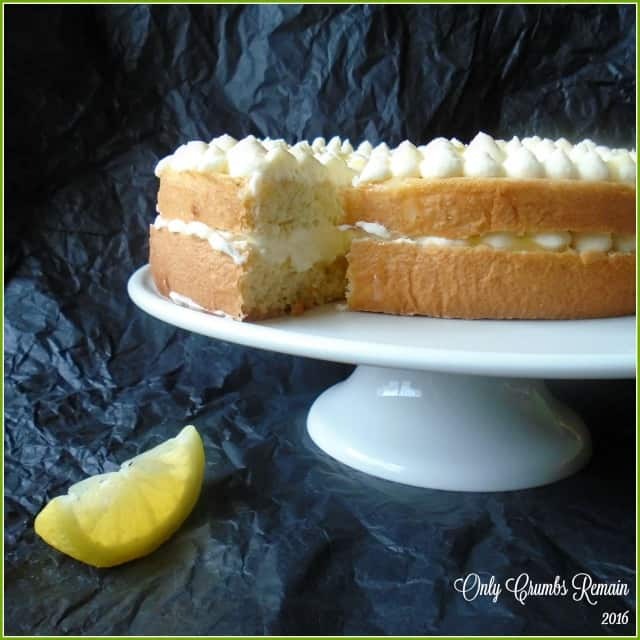 So, as I’ve already mentioned, for this month’s comparison bake I chose to look at two different ways to make a genoise sponge cake, to determined if there is a method which produces a cake with a better rise and with more aeration. The prompt for this bake came some months ago, though if truth be told it was over 12 months ago, when my mum celebrated her 65th birthday. To mark the occasion we made her an Apple & Cinnamon Genoise Cake, which by the way was absolutely delicious and was the perfect cake to round off her birthday. In looking for the correct ratio of ingredients for the genoise sponge cake I noted that there seemed to be two different methods mentioned for beating the eggs with the sugar. Some recipes described beating the two ingredients in a bowl suspended over a bain marie, in much the same way as we melt chocolate, whereas others made no mention of the gentle heat and simply said to beat the eggs and sugar together in the bowl of a stand mixer or with hand held electric beaters. So, the purpose of this Side-by-Side Baking comparison is to look at two batches of genoise cake; one prepared over a bain marie and the second without the assistance of heat. The aim is to identify if there is a better method for making a genoise, if the difference between the two bakes is worth any extra effort and if there is any difference in the time required to achieve the ribbon stage. So, what is a Genoise Cake? If you’re unfamiliar with a genoise cake, it is a beautifully light sponge which gets its name from the Italian city, Genoa. It is used in many patisserie bakes and is made with eggs, sugar, plain flour and a little melted butter. The rise and lightness of the cake comes from the eggs having been made with plain flour and no baking powder or bicarb. This cake is actually quite similar to a regular sponge mixture which we use for swiss rolls, though the genoise differs with the addition of a little melted butter, which brings a slightly longer ‘shelf life’ as well as making it a moister and tastier bake. The sponge can easily be flavoured, such as with lemon, orange or chocolate, and the cake filled and decorated. This time I created a rhubarb & custard genoise cake, it was amazingly delicious! 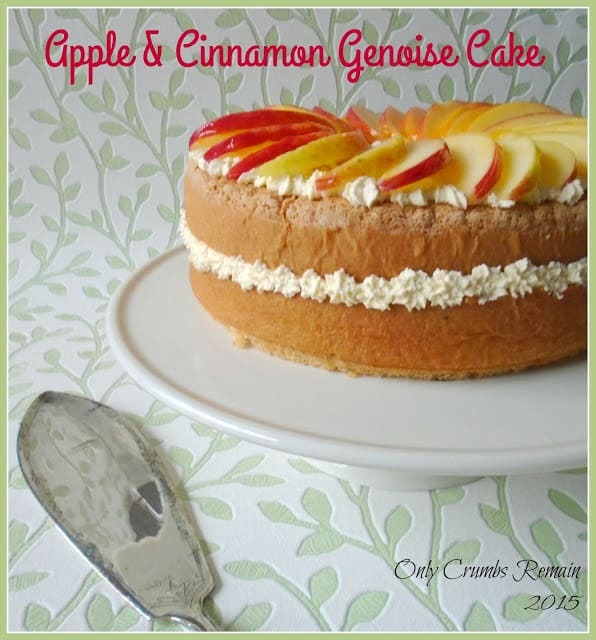 How are Genoise Cakes made? Genoise cakes are actually relatively quick to make with only a couple of steps – that is unless you’re beating them by hand with a balloon whisk which will obviously take considerably longer! The eggs and sugar are beaten together for a number of minutes until the mixture reaches the ‘ribbon stage’. This simply means that the mixture is thick enough for the beaters to leave a trail (or ribbon) of the batter on top of the mixture. The baker should be able to write the figure ‘8’ with the ribbon before it sinks back into the mixture. At this stage the melted butter is poured down the side of the bowl (so as not to deflate the batter had it been poured in the centre) and the flour sifted in. The ingredients are then folded in before being baked. There’s no denying it, a genoise cakes demand a lightness of touch, and as a result some home bakers avoid making them. But, please don’t let that put you off making one, they’re really not that difficult. At this point it may be worth linking to another of my side-by-side baking comparisons which saw the flour folded into a simple Victoria batter by hand compared to a spatula. The hand folding was quicker (effectively due to thinking of the hand as five spatulas rather than one) and resulted in a lighter bake. As working quickly is important when making a genoise, or even a sponge cake, the hand folding technique was applied in this particular comparison bake too. Making a Genoise Cake – The Two Batches. Batch 1: The eggs and sugar were beaten with hand held beaters. No heat assistance was used. Batch 2: The eggs and sugar were beaten over the gentle heat from a bain marie. saw the electric beaters initially set to the lowest speed for 30 seconds whilst the sugar and eggs combined before increasing the speed to ‘3’ for the remaining duration of the beating. saw the cakes cooled in the same way. At first thought, as soon as the second genoise cake had been removed from the oven, it seemed clear that this bake, which had been prepared over the bain marie, had risen noticeably more during the bake. However, I was comparing a sponge cake which was fresh from the oven against a cake which had been cooling for about 40 minutes. It’s worth noting that this type of cake does deflate very slightly during the cooling process, and so I needed to employ a little patience and compare them once both cakes were completely cold! Once both cakes had cooled for about an hour, they were transferred to the same cooling tray to be compared side-by-side. At first glance there wasn’t an enormous difference in the height, but on closer inspection it seems that the first cake (which had been prepared without the aid of heat) had deflated slightly more than the second genoise cake. There were clearly more crinkles and wrinkles, in my mind, evidence of some deflation. Also, the second genoise looked ‘fuller’. Both of these points I think you can pick up from the image below. However, we didn’t identify any note able difference in the crumb once they had been sliced into. The second note-worthy point is the time each batter took to reach ribbon stage. The first batch which had been made on the work surface without the use of heat saw me beating the eggs and sugar together for nine and a half minutes. Where as the second batch, prepared over the bain marie, took a couple of minutes less time, requiring seven minutes of beating. 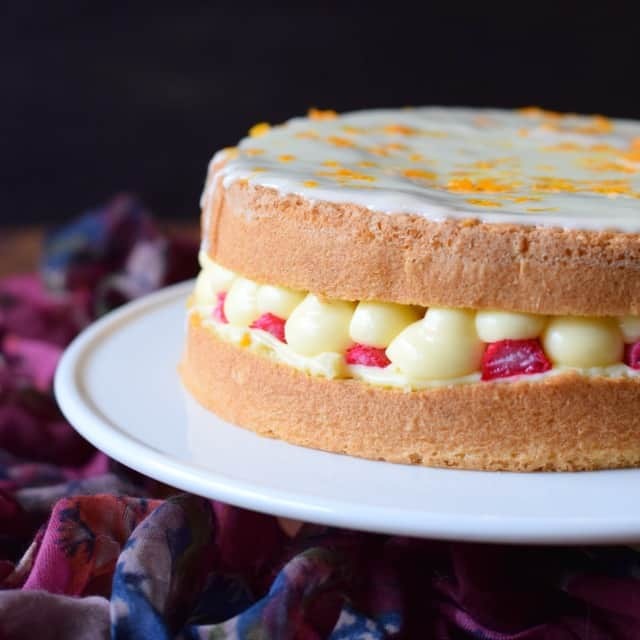 And if you’re wondering how I finished our cake, flavour wise, then check out the recipe for Rhubarb and Custard Genoise Cake, with a hint of orange for extra deliciousness! So, why does the bain marie give better results when making a genoise cake? The result of the two batches raises the question as to why the use of a bain marie helps to produce a better genoise bake. 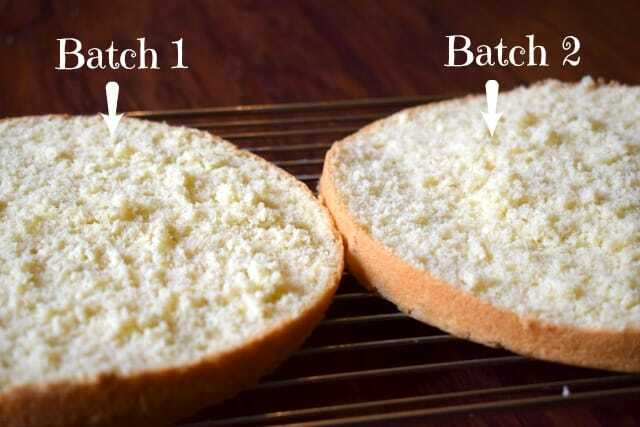 In many ways the answer is similar to the curdled cake batters comparison. James Morton, in his book How Baking Works, explains that ‘at high temperatures the proteins in eggs unfurl much easier allowing them to capture larger volumes of gas.’ He goes onto say ‘this is why you shouldn’t use eggs straight from the fridge because cold hampers their expanding properties. You want them to be warm enough to maximise volume without cooking the eggs.’ Others have suggested that the heat of the bain marie stabilises the mixture which may perhaps explain why batch 1 (the one prepared without a bain marie) deflated a little. Comments About Making Genoise Cakes Over a Bain Marie. The process of beating the eggs and sugar over a bain marie with electric beaters requires as certain amount of care. The electric beaters need to comfortably reach the work area without being over stretched (a task which may require an extension lead depending upon the location of the socket points!) and of course the baker needs to keep the bain marie steady whilst beating so as not to knock the pan of hot water over. The safety practicalities may mean that the possible over stretch of the beaters to the bain marie makes it an unsuitable method for some bakers. However, there are some alternative ways to achieve good results. 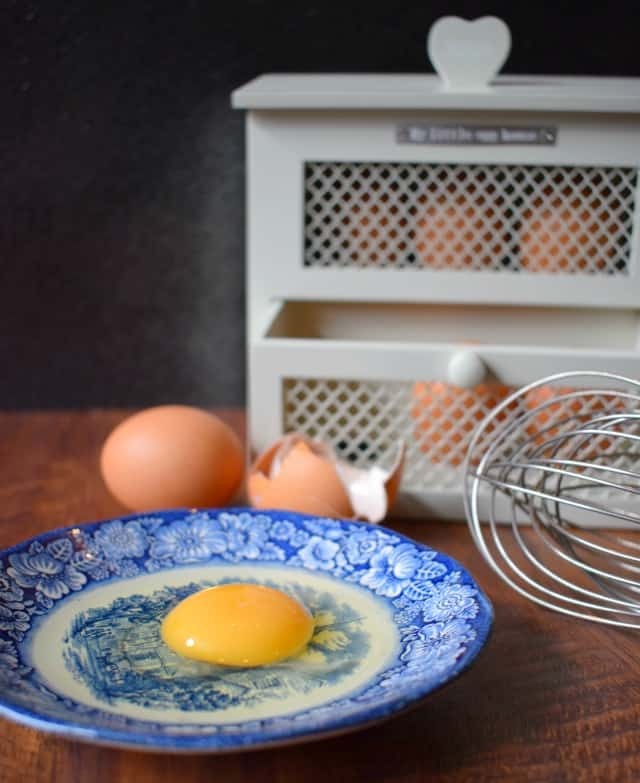 James Morton, again in his book ‘How Baking Works’, suggests warming the lightly mixed eggs and sugar over a bain marie until they are warm to the touch and then transfering the bowl from the bain marie to a stand mixer for beating. This of course removes the risk of potentially knocking over the bain marie pan whilst beating, though it also means the eggs will begin to cool slightly. Consider heating the eggs as James Morton suggests above, but move the bain marie and bowl set up to the work area near a plug socket and beat with hand held beaters. Although there is still a risk of the pan being knocked over, it does remove the problem of over stretching the beater’s cord and it maintains the temperature of the eggs with the residual heat from the pan. If you don’t have a stand mixer or electric beaters, the genoise sponge can still be made with the use of a balloon whisk though of course it will take a large amount of effort to whisk it to the required stage (something mum and I know all about when we made such sponges years ago). Aw thankyou Kirsty, I'm glad you're enjoying the series. The next one is already in the pipe line! I have to say, if you're preparing your genoise over a bain marie then you're already warming the eggs. It's a subtle difference but I do think it certainly helps achieve a better outcome. Thankyou Sarah. It is a bit more effort isn't it, but I personally think it's worth it. 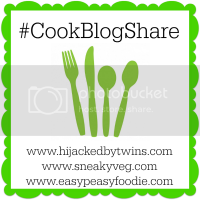 I know just what you mean about being clumsy in the kitchen though – I really have to take a step back before I start making one over a bain marie rather than just diving in which is usually when i knock things over or burn myself! James Morton's book is great – so many useful tips and explanations along with some lovely recipes. I'm sure you'd love it if you popped it on your birthday list. Ooh that's an interesting one – that'll certainly be putting that on the list of ideas – thankyou 🙂 I must admit that I'd heard Canadian bread flour was the best and that weather can play a part in it all, but I really hadn't appreciated that it can be so bad as to prevent the bread from developing as it should. Very interesting! It's fascinating. I like your series a lot. I wish I had the patience to try side-by-side baking (I also wish there were loads of people in the house eating my food so I don't put any weight on :)) ). Thankyou Anca – it fascinates me how apparently small difference can have quite a difference in a bake. i know just what you mean though Anca about the weight thing! there is only hubby & me here (and the cat!) so often our bakes get shared amongst family friends and neighbours!